LONDON, UK, 2018-Apr-26 — /Travel PR News/ — British Airways is partnering with British specialty roaster, Union Hand-Roasted Coffee, to provide customers with great tasting coffee in the air and on the ground. The airline will be serving the UK based company’s hand-roasted coffee in all of its UK lounges and to those travelling in its First and Club World cabins, from next month. Founded in 2001 the east London based Union Hand-Roasted Coffee, is one of the UK’s largest speciality coffee roasters and suppliers. Together with British Airways, the direct trade* coffee supplier has developed an exclusive blend that works well at 35,000ft. Sourced from Peru the medium roast blend has espresso tasting notes of chocolate, pecan, and caramel, which will complement dishes served on board, such as the chocolate délice or warm bread and butter pudding. Sarah Klatt-Walsh, British Airways’ Head of Product, said. “Our £4.5bn investment programme for our customers doesn’t just focus on the big-ticket items – we know it’s often the small things that really make a difference to them. A great cup of coffee to get them up and hitting the ground running after a long haul flight is exactly one of those details that really matters. 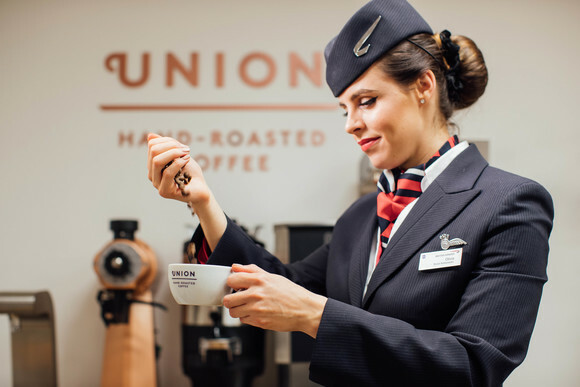 The coffee stations within the airline’s UK lounges will be revamped as part of the introduction of Union Coffee, to best display the wide range of options and detail the company’s dedication to sustainable sourcing. This joins a number of other changes to improve the quality and quantity of food in its lounges at Heathrow a nd Gatwick. Hot food is now available throughout the whole day, with a better selection of vegan, vegetarian and gluten free options, including organic soups. First customers can select from a wide range of coffee options on demand, including latte, cappuccino, filter coffee and espresso. The airline’s Club World customers can enjoy premium filter coffee. British Airways is investing £4.5 billion for customers over the next five years. As part of this investment the airline has spent millions of pounds in its World Traveller (long-haul economy cabin) catering, introducing an exciting and expanded new menu, which provides more quantity and quality to both meals and great snacking options throughout the flight. The investment also includes installing the best quality WiFi and power in every seat, fitting 128 long-haul aircraft with new interiors and taking delivery of 72 new aircraft. The airline is also investing £600m specifically in Club World, including outstanding catering and luxurious White Company bedding – plus, from 2019, a new seat with direct aisle access. • Coffee provided by Union Coffee will be available in all Club World and First cabins by May 31. Union sources its exceptional coffee via its unique model Union Direct Trade. This sees Union build close, long-term relationships with farmers in coffee growing communities while paying at least 25% above the Fairtrade minimum price, and actually paying an average of 50% over in 2017. Union was the first UK company to link sustainable development with exceptional quality coffee through its pioneering business model Union Direct Trade, and remains a leader in this area. Union’s dedication to sourcing exceptional coffee dovetailed with the speciality coffee revolution, and the company has achieved significant year on year growth since foundation. In 2017, Union’s leadership in the area of sustainability was recognised when it won a Queen’s Award for Enterprise: Sustainable Development – one of the UK’s highest business accolades. Union has also won Best European Roaster in the Allegra European Coffee Awards for three consecutive years between 2014-2016, as well as numerous Great Taste Awards over the years. Union coffee is available at high-end cafes, coffee shops and restaurants, in Waitrose and Ocado, and through the Union website. Union Direct Trade is a pioneering model for sourcing an ever-higher quality of coffee through unwavering commitment to the principles of sustainable development. The heart of Union Direct Trade is the close and long-lasting relationships Union builds with farmers in coffee growing communities around the world. Union Direct Trade guarantees payment of at least 25% above the Fairtrade minimum price as well as a trusted route to a speciality market. Not only that, Union works alongside coffee growing communities to increase quality and quantity of yield, and improve working conditions. This creates a virtuous circle that helps farmers to plan for the future, and gives Union access to exceptional quality coffee. Since 2002, Union Direct Trade has improved the lives of over 11,000 people in developing countries. This entry was posted in Airlines, Airports, Flights, Food & Drinks, Travel, Travel Services, Travelers and tagged British Airways, coffee, Jeremy Torz, Sarah Klatt-Walsh, Union Hand-Roasted Coffee. Bookmark the permalink.